As I mentioned several weeks ago, bringing back recipes to the blog is one of my goals for 2016! I’ve had so many requests and questions from you all on Instagram, Snapchat and email, that I thought I’d start with some of my favorite healthy recipes. 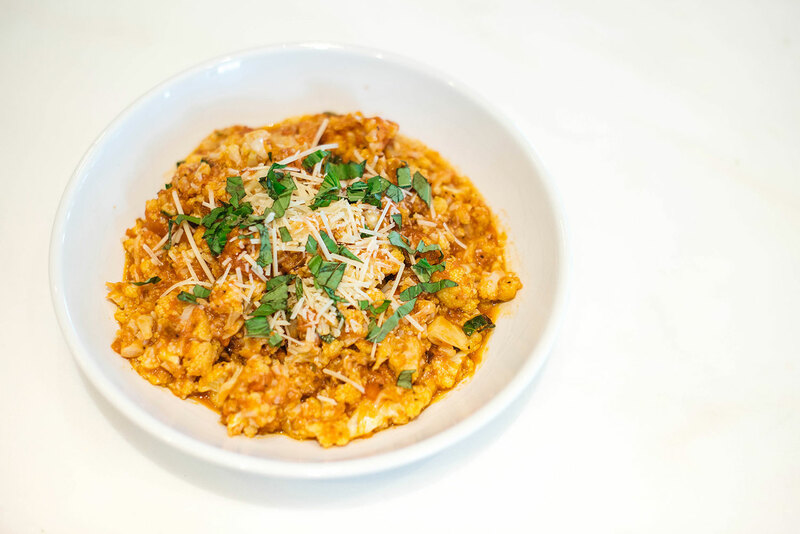 For the first one, I’m sharing the recipe I make most of all: cauliflower pasta. I started making this in November 2014 when I decided to cut most bad carbs from my diet (specifically bread and pasta). Unfortunately, pasta is one of my all-time favorite dishes, so I was desperate to find an alternative I could eat on a regular basis and still maintain the no-carb routine. After testing out various vegetables, I decided cauliflower was my favorite. Compared to veggies like broccoli, it tastes less like an actual vegetable when topped with sauces. This is a great stand alone dish if you’re cooking for one, but it also makes a wonderful side dish to grilled chicken, steak or another meat. It has so much flavor without all the guilt or stomachaches you get from a plate full of pasta. Even the pickiest eaters love it – I’ve tested it out on everyone in my family! 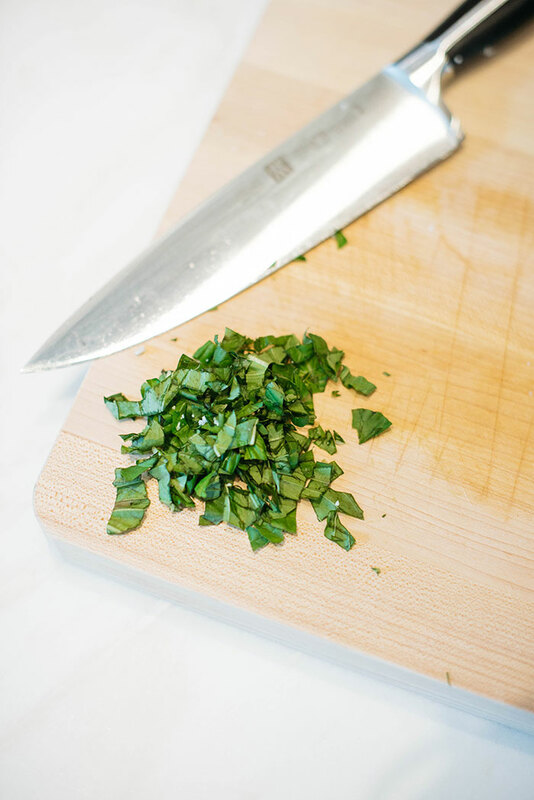 PS – because of the small number of ingredients needed (and some of them aren’t even necessary! ), it’s a very inexpensive meal. That’s how I saved money (and stayed healthy) while abroad! Turn on your oven to 425°. Wash the head of cauliflower, and then cut up into bite-sized pieces (discarding chunks from the stem). 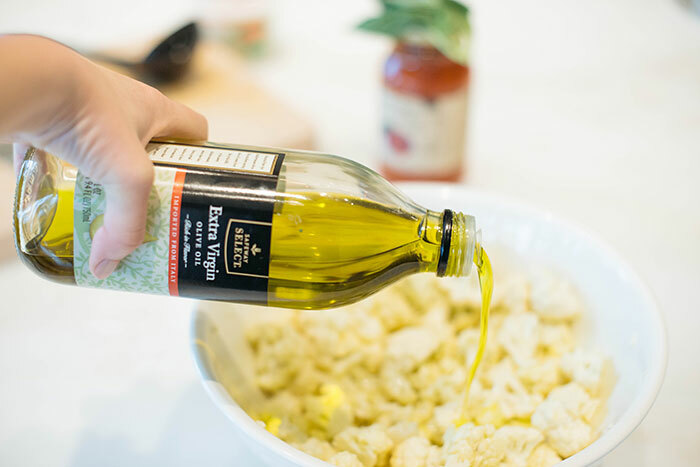 Place the bite-sized cauliflower florets into a large bowl and toss with enough olive oil to coat all the florets. 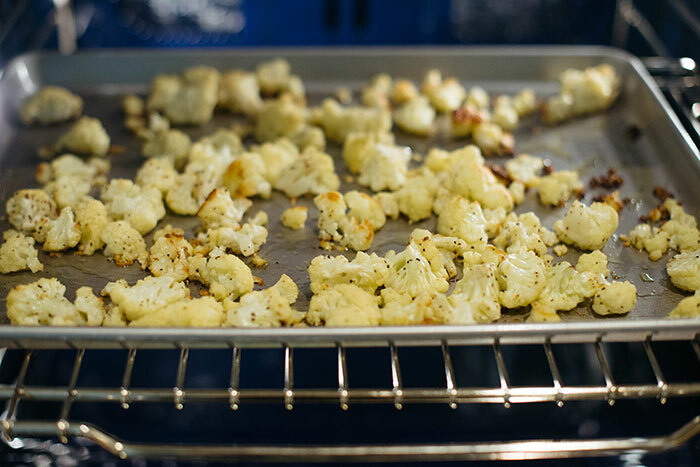 Sprinkle the florets with salt and pepper and toss again before pouring out onto a non-stick cookie sheet/oven pan. Stick in the oven and bake for 20-30 minutes or until tender and brown on the edges. 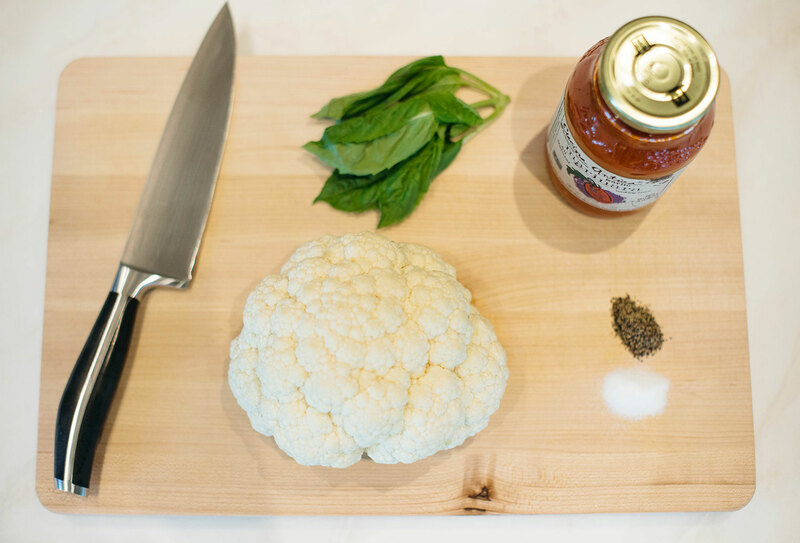 In the last ten minutes the cauliflower is baking, chop up some fresh basil and set aside. At this time, you should also start heating up your marinara in a large saucepan – just make sure the saucepan is big enough to pour the cooked cauliflower into! If you love basil like I do, add half of the cut-up basil to the sauce while it’s cooking and save the other half for garnish. 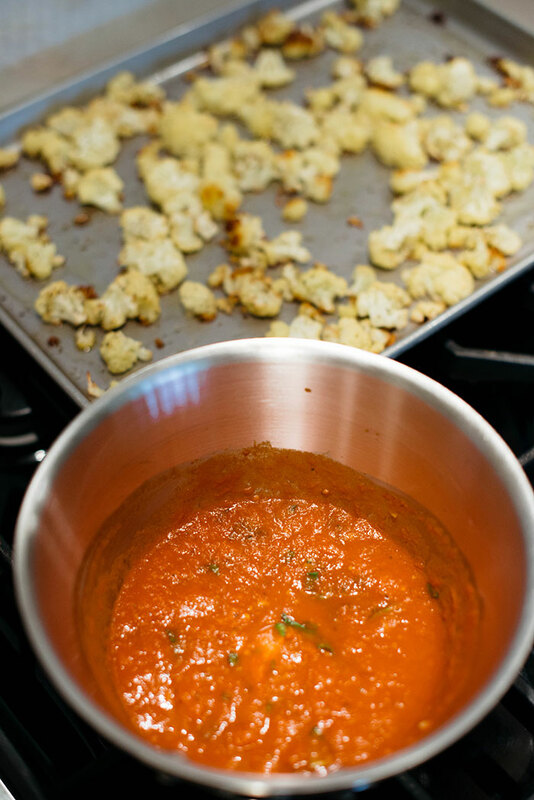 Once the cauliflower is done baking and the marinara is bubbling, pour the cauliflower into the saucepan and stir until the cauliflower is completely coated in marinara. From here, pour cauliflower into a bowl and sprinkle with parmesan and fresh basil. The amount of cheese and basil you put on it is totally up to you – I always put a lot of both! And that’s it. Bon Appetit! Check back every other Sunday for a new recipe on here – if you have any recipe requests or questions, email me! I cut out most carbs last year, and it has been SO good for my weight and skin. I do typically make the same 5 dishes though, so I’m excited to try this one out after seeing it on your snapchat. Yum! This looks and sounds delicious! I’ve been really into zoodles with marinara sauce (which I make myself….it’s Giada’s recipe and it’s super easy) but this looks equally healthy and simple. Definitely must give this a try! Okay so I read about this on Instagram and I was like, but could it really be good? Okay, I take it back because this looks delicious! Looks healthy and delicious! I’m a vegetarian and I would definitely give this recipe a try. Thanks for sharing!